This year a number of unwanted events have reminded me of just what a privileged life I live. Earlier on in the year our boiler broke down and left us without hot water for a couple of weeks. It’s only when you don’t have it that you suddenly realise what a privilege it is to be able to turn on a tap and have hot water come gushing out. It’s when you have to go around to a friend’s house or fill the bath with kettlefuls of boiling water in order to wash that you appreciate just what a luxury it is to stand under a hot shower in your own home. A second, more alarming, occasion was a Saturday afternoon when our youngest daughter came in from the garden with blood running from her lip – she’d had an accident on the trampoline and managed to knock out her top two front teeth (mercifully only baby teeth). Within a few minutes I was able to phone the emergency dental line, speak to a dental nurse and within a couple of hours of the accident she was being seen by an emergency dentist. We now have a new boiler and our daughter is suffering no ill effects from her experience but those two events brought home to me just what level of physical blessings we enjoy living in a wealthy country at the beginning of the 21st Century. We take for granted that we can shower in the morning and that we have free emergency medical care from expertly trained staff available at any time of the day or night. But the fact is that it’s only within the last 50 years or so of the long history of the world that such facilities have been available for anyone, and even then only for the minority of us who live in the richer countries of the world. A hundred years ago most houses in Britain didn’t even have a bathroom. If there was an accident few people had a phone to call for help even assuming the doctor had one and was in. Nor did ordinary people have cars to take the patient for help. And of course any treatment would have to have been paid for. The things we take for granted and accept as ‘normal’ in our day and age would be thought of as extraordinary luxuries by every other generation in history. Yet today in the UK no-one thinks of hot water, carpets, internet connections, washing machines, mobile phones, television, cars, electricity or shoes as luxuries. They have become the new standard of normality. We feel sorry for people who cannot afford to run a car. The idea of children without shoes has become unthinkable. Our culture has accepted a particular ‘standard of living’ and we can easily start to assume that we all have a right to that standard of living. It’s so easy to get into the mindset that these things are our rights – whilst we were without hot water I found myself getting grumpy about having to wait an extra day for a shower! On the rare occasions when the network drive fails at work people start grumbling that they can’t do their work – that’s human nature. But then I find the same is true of me at home if I can’t access my e-mails for a couple of days. I start to think I can’t manage without them – yet 20 years ago e-mails were a new idea! 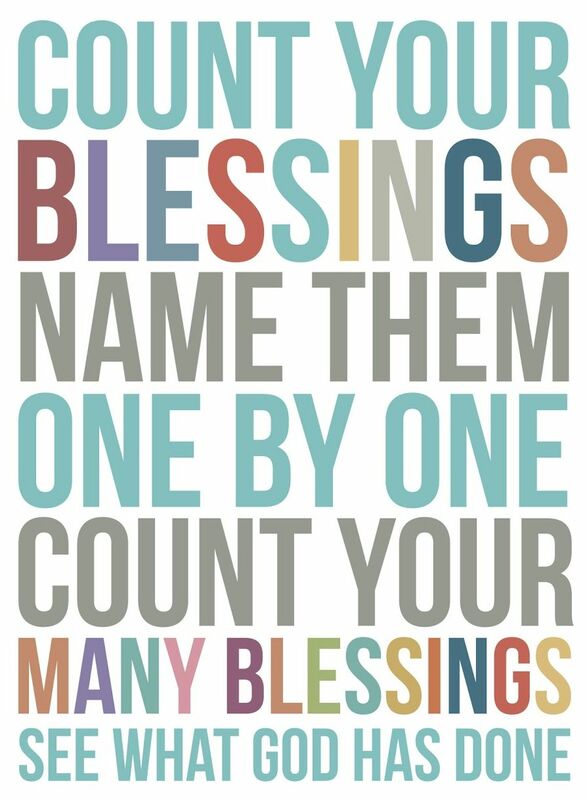 We need to constantly be counting our blessings and thanking God for them. Why not write down all the ways God has blessed you and thank him for each of them? Then keep that long list and go back to it when you realise you are starting to take things for granted or are getting irritated because you’ve run out of printer ink or smoke alarm batteries and can’t wait till tomorrow to replace them. And we need to be repenting of our grumpiness and dissatisfaction when we don’t have the things that we ‘feel’ are our rights (even when we know in our heads that is ridiculous). Any blessing that we have is a gift from God and should be a cause for gratefulness, never an excuse for complaint. When the rich young ruler came to Jesus he was told: “You lack one thing: go, sell all that you have and give to the poor, and you will have treasure in heaven; and come, follow me.” (Luke 18:21) That particular man could only be a follower of Jesus by getting rid of everything he owned, both luxuries and necessities – because his great temptation was to covetousness. For others it may well be one particular thing or things which must be parted with. Some of us know that we could not follow Christ if we had a TV in or internet access to our houses, because that would be too much of a distraction or temptation. Others have to give up their attachment to a football team or a cherished sports car or their horse-riding because their love for those things would inevitably take away the time and effort they need to give to the life of the church and the work of the gospel. But some of us will be called to give up everything – a well-paid job to pastor a church or care for an elderly parent. Or all the luxuries and safety nets of the UK to carry out pioneer missionary work in a third world country. Is there something in your life you need to be getting rid of? It can be a real comfort and reassurance to know that we have a steady job with regular income, that we own our home, that we have a comfortable balance in the savings account or that there are free medical services available whenever we need them. But it’s too easy to start relying and trusting in those things instead of the one who provides them for us. Jesus told his disciples that ‘it is easier for a camel to go through the eye of a needle than for a rich person to enter the kingdom of God’ (Luke 18:25). Throughout history the proportion of wealthy Christians has been very low compared with poor Christians because it’s so difficult for rich people to stop trusting in what they have and to only rely on Christ. It’s no surprise that Christianity has been in decline in the West for the past 60 years while the church has been growing massively in the poorest parts of the world. It’s a lesson we have to learn and God often uses poverty or the loss of things we value to teach us this lesson. Whenever we trust anything instead of Christ we are making that thing an idol – the Lord will never allow his people to continue in idolatry. We all have to make choices about how we spend our money and it’s right that part of that should reflect the standards of the culture we live in – we expect to live in brick houses rather than build mud huts, to be clean rather than smelly, to ensure our children can read and write – in some cultures those wouldn’t be requirements for believers. But our choices must be made before God, seeking to please him and must be made with thoughtfulness and prayer rather than by copying other people. If everyone else we know has two cars in their family then we can feel that we should have two. For some families that will be the right decision but for others they will want to catch buses or cycle in order to cut down that expense. One family will feel that having a dishwasher will save them valuable family time which can be used together for family worship – another family will wash up by hand but use a tumble dryer for their clothes. We mustn’t be afraid of being different from other people, whether unbelievers or fellow church members. But we must also consider the effects of our choices on other believers in the church – maybe we could afford a second car but buying one would encourage others to spend money they don’t really have. It’s so difficult for us to work things out in this area wisely and well. There was a time when there was little connection between believers in different lands but not so today. We know about Christians suffering intense persecutions and loss of all their possessions. We read about churches in Sri Lanka and can easily feel guilty that they are struggling to grow enough food to eat while we shop in supermarkets piled high with things to eat. Our missionaries are often better off than those they’ve been sent to work among. We need to recognise there are different standards of living in different countries. What’s normal here is not normal there. The decisions we make living in the UK won’t be the same as the ones we would make if living in another culture. God has put us in different places. Being richer doesn’t mean we are better off. Those believers struggling to survive in Sri Lanka have a joy and an appetite for the gospel which far outstrips our own. Which of us is really richer? We aren’t able to help and cannot help every situation we hear about. We have limits in our resources not only financially but also in the ongoing interest and prayers that ought to accompany anything we give. Much better to find one or two situations of need and commit our resources and gifts to those places. Having wealth places great responsibility upon us. Not only to give but to give responsibly. We have to work at identifying situations where money coming from outside will be used well. Not to make people dependent on outside aid. Not to give in a way that puts people under obligation to us. That’s another reason for limiting the situations we give to – because we have limited time to investigate and choose where to give. These are all real dangers and there is far more we could say about all these areas but let me finish where I started. Whatever else we think about let us never take our blessings for granted and let us never stop giving thanks to God for all the blessings he continues to pour out upon us.